 referrals for physiotherapy, massage therapy, chiropractic, etc. We have embraced some changes that will enable us to provide all the services you and your family need, while allowing our clinic to operate at maximum efficiency and maintain our focus of providing quality care. We are excited to introduce a new program to our practice, called PatientSERV365*, also known as PS365, to help you cover the costs of uninsured services in a hassle-free and efficient manner. 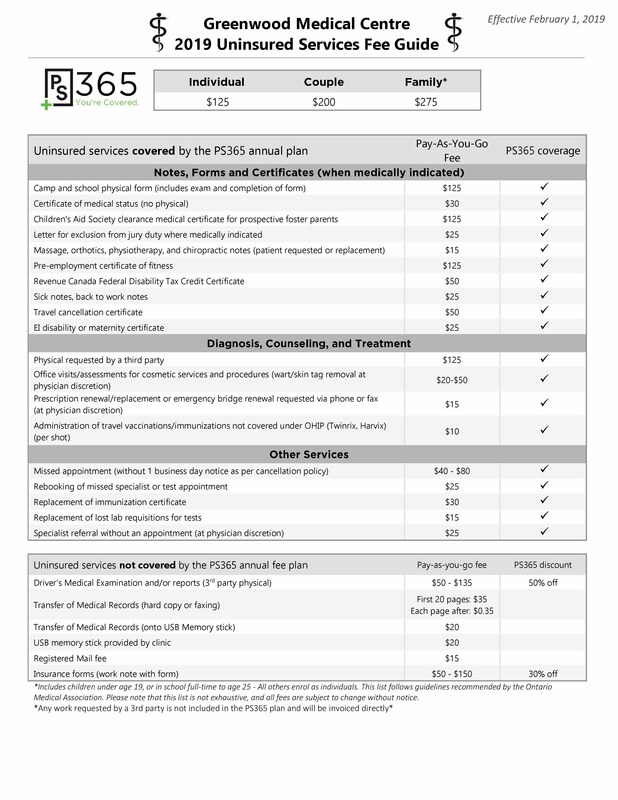 This optional annual fee plan covers the costs of most uninsured services for one year, and allows the office to maintain our focus of providing quality care (see full list of services on back). We believe that the PS365 program is fairly priced and have included subscription rates specifically for individuals, couples and families. We hope that you will seriously consider the benefits for both you and your family. Of course, you may choose not to participate in the PS365 program. In this case, any uninsured services you receive will be charged on a “pay-as-you-go” basis. For this option, you may leave a credit card on file that will be held securely and charged only when an uninsured service is provided.  Enroll online at www.patientserv.ca (select Login, then Sign Up to be a PatientSERV Patient). The administration of the PS365 program is handled for us by PatientSERV*. If you have any questions about this program, please contact PatientSERV at 1-800-385-3210. Thank you for placing your trust in us to provide you with the highest quality healthcare possible, which we hope to fulfill for many more years to come. Ontario) and the OMA (Ontario Medical Association), for more details please look under “Block Fees” on their respective websites.